"The Voice of the Steel City"
"Sing, Sing, You Tetrazzini, You"
When Frances Kennedy and her husband brought Gay Mill to Miller Beach she was a veteran of almost two decades of musical comedy and vaudeville, and she wasn’t done. She loved entertaining people from the stage as much as she loved her family. She hasn’t been written about in books, she was one of some 12,000 vaudevillians on stage in 1920. For 30 years from musical comedy to vaudeville she was widely known among those who loved the popular theater. This is a glimpse into her career. Son Thomas born August 5, 1906; Daughter Frances born July 7, 1911. What did the act look like? A Broken Nose - the train accident. Two seasons on the road - 1922-1923. On the road with Jack Benny and Houdini. Photo Credits not from newspapers. About this page and contact me. This page is best viewed in landscape on your device. Images will enlarge when clicked. As a young 20 year old switchboard operator who had sung solos in her church choir since she was 10 she had her eyes on the stage. No doubt preforming in local and school theater at a young age, likely her first professional experience was with the Ziegfeld company of Anna Held’s (Footnote: Anna Held, the five foot tall common law wife of Florenz Ziegfeld, was one of the most well-known stage performers of the fin de siècle and into the twentieth century.Wikipedia article on Anna Held. ) Mam’selle Napoleon, a musical in five acts that had a huge cast, some 80 to 100 people including the chorus, of which Frances was a member. When she joined production isn’t known except that when its tour finally ended in Chicago on June 4, 1904 the paper said she had been with the company for a year and a half, which, if true, she had joined when Mam’selle Napoleon opened October 28, 1903 in Philadelphia (Footnote: Advertisement, The Philadelphia Inquirer, October 28, 1903, page 7. “TO-NIGHT / FIRST TIME ON ANY STAGE” ) when she was 25. The show toured extensively in the east before going west: among many other stops were Minneapolis – Butte, Montana - Seattle – San Francisco – Los Angeles – Salt Lake City and finally to Chicago in a five car special train that set a speed record at the end from Omaha to Chicago. (Footnote: “Rock Island Makes Record,” Chicago Daily Herald, June 17, 1904, and others. “The Rock Island has established a new record for fast time between Omaha and Chicago. May 22nd, a special train of five cars, carrying the Anna Held Company, left Omaha at 1 a. m., arriving at Chicago at 12 o’clock noon.” ) Mam’selle Napoleon closed June 4th at the Illinois Theater after 7 months and a week. Frances Kennedy was off and running on a career that would incorporate that kind of travel. The Chicago Inter Ocean noticed her and ran her picture, calling her one of the "most stunning of the Anna Held show girls." Following the final performance of Mam'selle the Illinois theater had a short run of Richard Carle's The Tenderfoot and that was followed by The Forbidden Land by the Dearborn company which Frances joined becoming one of the "Tibetan Ladies," Motema. Forbidden Land ran for 6 weeks in July and August of 1904, after which she joined the company at the 700 seat La Salle Theater where she would stay for nearly two years performing in 5 plays, slowing working her way up in the casts and in attention in the papers. The Isle of Bong Bong ran for 3 months beginning on March 15, 1905, closing June 17th. Four days after the closing she married Tom Johnson, a $890.00 a year (Footnote: American Almanac, Year-book, Cyclopedia and Atlas, Volume 2; Google Books. ($24,665 in 2017 money.) ) assistant prosecuting attorney in the City of Chicago law offices who was prosecuting arson cases. 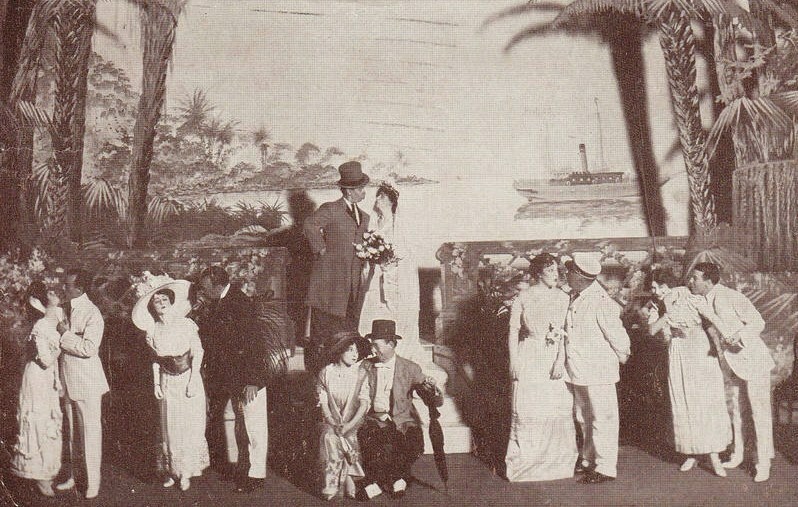 After a short honeymoon to Mackinac Island she opened in The Yankee Regent at the La Salle on August 12, a play that ran over 150 performances until the first day of December. She played Henriette Craig, an American millionairess. The next day, December 2nd she opened in The Umpire, a play that proved to be a success, running 304 performances to June of 1906 setting a record for the longest running play in Chicago history when it hit 204 performances in April. (Footnote: "Some Long Runs in Chicago Houses," Chicago Tribune, April 8, 1906, page 79. ) It was the story of a Chicago baseball umpire who fled for his life to Morocco after a bad call and featured a song called "The Umpire is a Most Unhappy Man." Frances left the cast several weeks before its closing, being about 5 months pregnant with Thomas junior who was born August 5th. 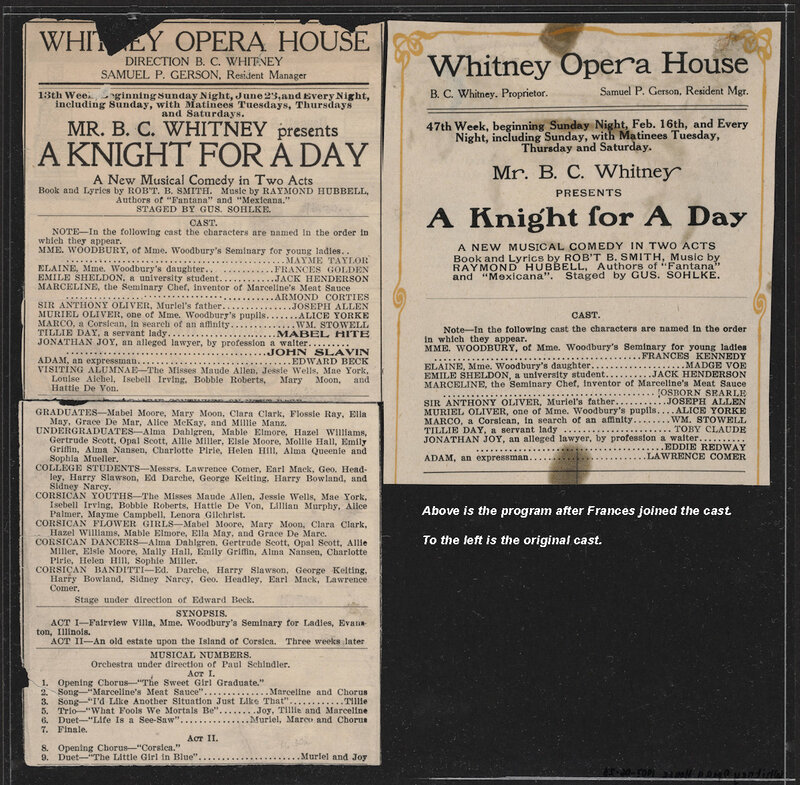 Frances took a year off to have Tom junior, but headed back to the stage on July 28, 1907 joining the cast of A Knight for a Day which had opened at the “new” Whitney theater in March. It ran through the winter until February 29, 1908 with over 500 performances. Chicago Tribune Sunday Magazine Feature. Or download PDF from a new window. No rest for the stage struck: a week later, on March 7th she opened with the cast of The Three Twins at the Whitney opera house, but not before an out of town trial in Peoria. “On the Road With a Comic Opera Company” was a delightful, full page write up in the Chicago Sunday Tribune a month later detailing what a theater company goes through taking a show on the road for its first performance. The Three Twins turned out to be a huge success, playing for over a year, first in Chicago and then New York where it moved to in June of 1908. The play went on the road playing extensively in Wisconsin and other places in the Midwest in 1909, getting recognition in the papers. The popular song "Cuddle Up a Little Closer, Lovey Mine" came out of that show, recorded and used in films for years. The Tenderfoot had a short run at the Colonial, opening on June 30th and closing July 24th, but Frances was noticed: “A season in the east with the 'Three Twins' company has had a beneficial effect on Miss Kennedy’s acting,. Although she is more sylphlike than when last she appeared at the Whitney, her stature as a comedienne has increased perceptibly,” wrote a reviewer in the Chicago Tribune. (Footnote: “In the Theaters,” Chicago Tribune, July 3, 1909, page 10. ) Within two months Frances would be back in New York rehearsing in the Shubert’s management of The Belle of Brittany with star comedian Frank Daniels. When The Belle of Brittany scored “…a decided hit at the Queen’s Theater, London…” the Shubert’s brought the play to New York, and Frances got the part of Madame Poquelin. (Footnote: Frank Daniels was a popular comedian and stage actor. 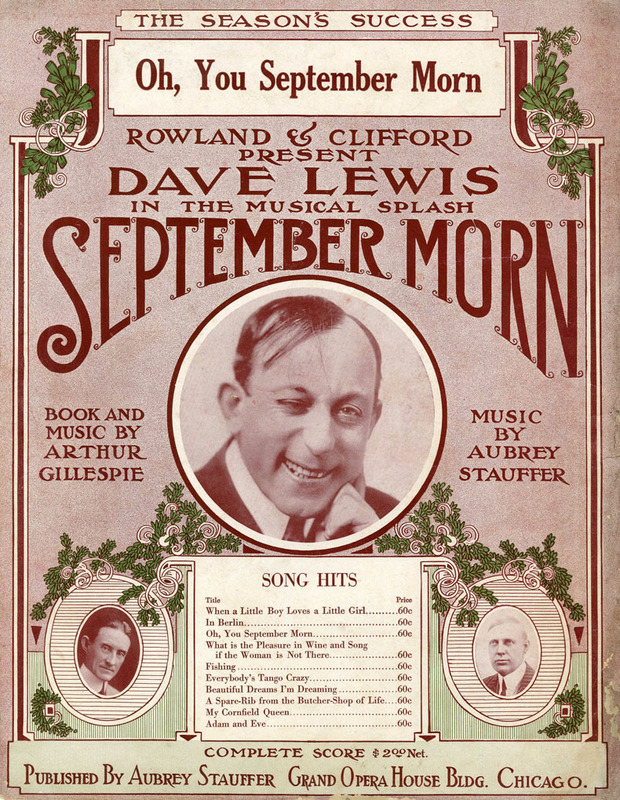 His picture is at the Wikipedia article on Daniels ) It opened at the Daly’s Theatre on Broadway on November 8th and ran 72 performances before closing and going on the road on January 8, 1910. (Footnote: Internet Broadway Database: IBDB Broadway performances ) With no understudy she was unable to return to Chicago when her mother, Sarah Kennedy, died on the 20th. (Footnote: Chicago Tribune, January 21, page 8. ) The tour went to Shubert theaters in Connecticut - Buffalo - Detroit - Olathe, Kansas - Kansas City, St. Louis - Indianapolis - Cincinnati, where it ended its tour at the Lyric in April, with the word that Frank Daniels intended to continue the play the next season, which he did, but without Frances. By August of 1910 she was back on the stage in Jumping Jupiter at the Cort Theater in Chicago with Richard Carle, with whom she had worked in his revival of The Tenderfoot. A Woman's Honor - or a husband's jealousy. In November of 1910 Frances, and her husband, made the headlines, not for theater, but for a woman’s honor, or a husband’s jealousy. After a performance of The Chocolate Soldier, Frances, her husband, and two other couples were at the Union restaurant, Clark and Randolph Streets, when another patron began staring at Frances. Tom took offense when the bloke came over to the table and offered to buy the ladies wine. A bit of a scrimmage broke out and the patron, reportedly 6’4" and weighing 350 pounds, left with a broken nose. The story made front page of the Inter Ocean and page 2 of the Tribune, both with pictures of Frances -- you have to love the hats. After a run of 3 month’s run at the Garrick the play went on tour the second week of January, 1911, Frances leaving it in April in Ottawa when she was 6 or 7 months pregnant with Frances junior. It was a year before Frances appeared in the newspapers after Frances was born on July 7, 1911: that was an appearance at a “monster memorial” show for a recently deceased popular sportswriter on July 21, 1912 and was followed by beginning rehearsals in New York for a show that would open on Broadway on November 13th, The Red Petticoat. 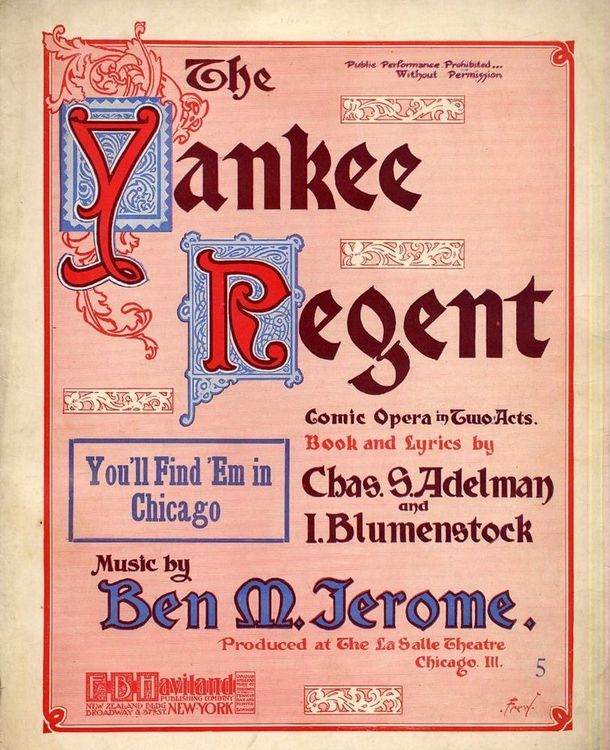 The Red Petticoat was Jerome Kern’s first complete score, (Footnote: Wikipedia article on this being Jerome Kern's first complete score is undocumented, but seems to be borne out by Kern’s obituary in the NY Times, November 12, 1945. Kern was best known for Show Boat. ) 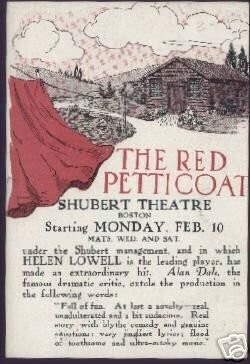 a Shubert production that starred Helen Lowell, with Frances in the role of “Sage Brush” Kate - another show with huge chorus of some 75 people. (Footnote: IBDB. ) After mixed reviews and two theaters on Broadway it went to Brooklyn and then on tour to Pittsburgh - Hartford - Boston - Chicago, and then Buffalo where the show ended April 6, 1913. In the summer of 1913 Frances won a part in A Broadway Honeymoon at the Joe Howard Theater (formerly the Whitney). A musical comedy treating satirically the confusing divorce laws around the states it was to have had Sophie Tucker in the cast, but she withdrew over a dispute over prominence in the cast. (Footnote: Chicago Tribune, August 26, 1913, page 10. Online biographies of Sophie Tucker are devoid of information on her career in this time period, but a quick review of the papers in Illinois indicate that she appeared in a number of venues in and around Chicago from 1909 onward with regularity. 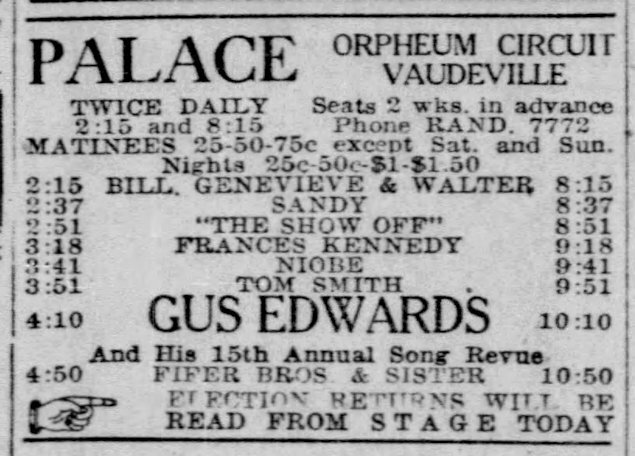 Frances would appear on the same vaudeville billing as Sophie in 1918 at the Majestic in Chicago. ) The show, which opened October 3rd and closed in Bloomington November 27th was short lived despite a nice review in the New York Clipper which says Frances is “…loveable in a light comedy role. The show is neat, compact, busy, and a bully evening’s fun.” (Footnote: New York Clipper, October 11, 1913. ) It is likely Frances tried to squeeze in a benefit show when she took a leading role in a minstrel/vaudeville show with an all-women cast of 80, a first for the newly formed Northwestern Women’s Athletic Association. She is listed first in the cast on November 7th, but there is a different leading lady in the reviews of the two performance show on December 6th. (Footnote: “Choose Star Cast for W.A.A. Show,” Daily Northwestern (Evanston, Il), November 7, 1913, page 1, and succeeding reviews in the same paper, especially the one on December 9th which says that a new leading lady was hurried into the part. ) She likely left for rehearsals of September Morn, which opened December 20th at the La Salle. In a mixed review in the Chicago Tribune Frances is given much credit for her rendition of the ballad “Beautiful Dreams I’m Dreaming.” Whatever the case, the evidently popular musical comedy ran from December 20th at the La Salle for 15 weeks until the first week of April, then dying in the Quad Cities in western Illiois and eastern Iowa at the end of April. In the reviews and notices Frances rose above, or at least equal to, the stars Dave Lewis and Minerva Coverdale. 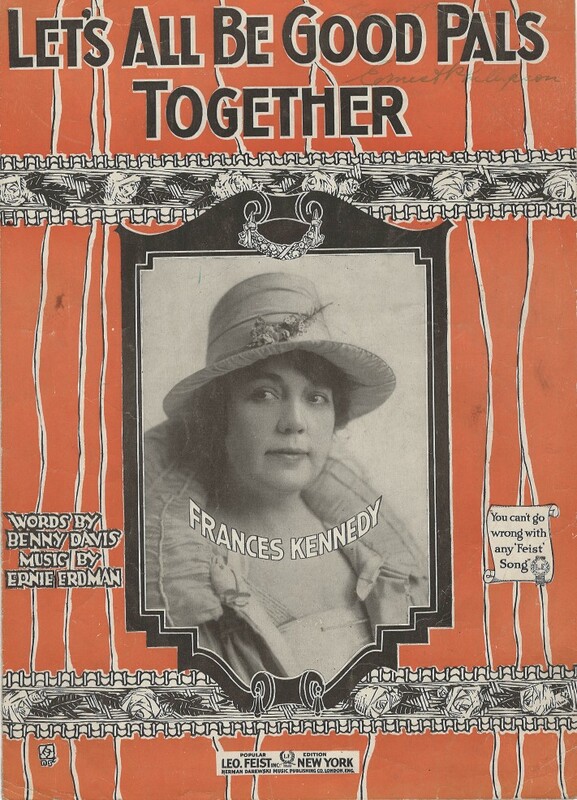 Seemingly after a break, Frances joined the cast of Within the Loop on August 29, 1915 when the huge musical revue had been in rehearsal for 5 days. 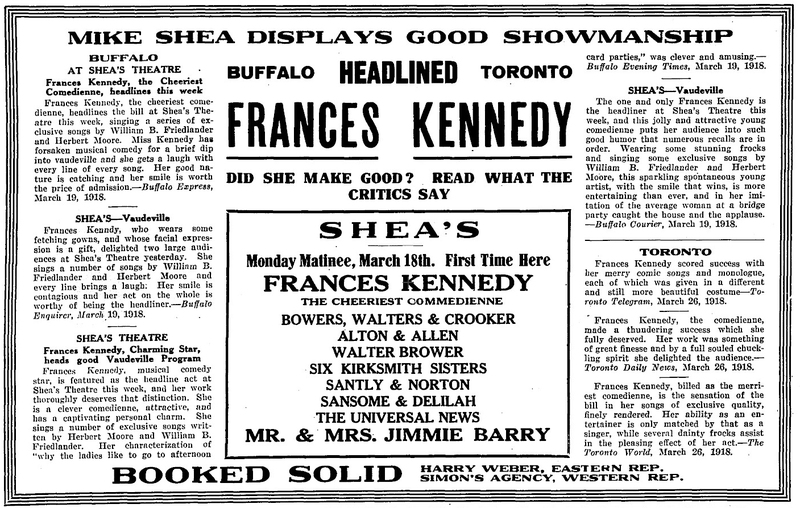 It opened in Buffalo November 22th with Frances as a headliner in a cast and chorus of 125 with anywhere between 38 and 34 musical numbers in it depending on which newspaper you look at. It was, as the Buffalo Courier wrote on the 24th, “…live-wire entertainment mixed with peppery songs and flavored by dashes of brilliant color…” Following Buffalo it traveled to Detroit for a week, then Pittsburg for a week and finally in Chicago at the Chicago Theater on December 29th. After several weeks it opened in St. Louis on January 23rd, then played in Indianapolis - Muncie, Indiana and Cincinnati, closing in Dayton, Ohio the second week in February with everyone going home. The Washington Post wrote on the 20th that it was supposed to come there, but had closed. When Frances took to the vaudeville stage it was at the beginning of its decline, but had at least a decade and a half of life left in it. Silent films would sometimes be part of a billing but by the end of the 1920s, when the “talkies” came in, vaudeville lost out to that two-dimensional world of popular entertainment. It was under the firm control of two major billing agencies which controlled not only who performed, but many of the theaters they performed in: the Orpheum and the Keith circuits. Who performed was rigorously controlled by the Vaudeville Managers Association which discriminately gave thumbs up or thumbs down to acts based on how morally clean the act was. If you used off-color jokes or unacceptable words in your act you were given a thumbs down. Benjamin Franklin Keith and his wife Mary set the tone from their first theater, the Bijou in Boston, where he would putter around the theater fixing things while she dusted the chairs and cleaned upholstery. (Footnote: Gilbert, Douglas, American Vaudeville Its Life and Times, (1940), Whittlesey House (New York – McGraw Hill). Page 201. Gilbert’s book is also a great resource for the history of vaudeville, its performers and managers. ) For a performer, or his or her agent, the ultimate words to hear were “give him a route,” which meant from forty to eighty weeks straight time. (Footnote: Ibid, page 214. ) Frances would get routes in her career, but never that long. Needless to say, hers was a clean act, but satirical as we shall see. Vaudeville was not a variety show where a parade of performers come out quickly followed by another after a song or five minutes of jokes, like the Ed Sullivan show, Ted Mack’s Original Amateur Hour, or the reality star shows of today, which, of course, have a lot of filler between acts. Instead it was a show where anywhere between four and eight acts would do 20 to 30 minutes followed by another. Shows would go on sometimes four times a day starting at 11 a.m. and ending around 11 that night, but two shows a day was more typical. 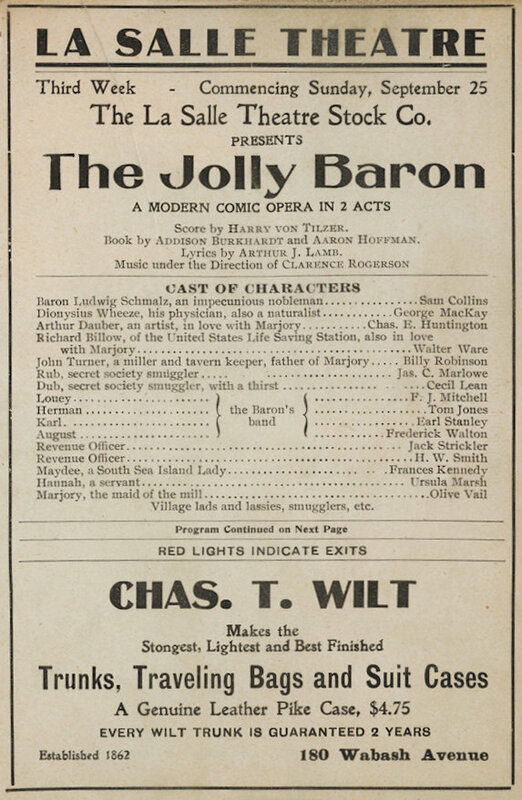 An act's placement in the show was worked out by the theater manager, not necessarily indicating "top billing," that occurred in the advertisements, usually with the size or placement as the ad and program for the same show at the Majestic shows. The ad for the November show at the palace shows the timing of the show that day. As one can see from that ad, Frances had 23 minutes allotted. These programs and ads are quite typical. July 1922 ad and program at the Majestic on the left, 1922 Ad from the Palace in 1922 on the right. Click to enlarge. So what did her act look like? 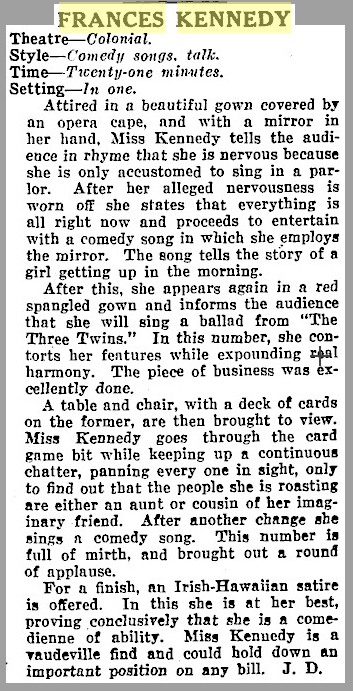 The description of her show at the Colonial in January, 1918 tells it better than anything. As for the jokes, they appear to be of the Joan Rivers, Rodney Dangerfield, Phillis Diller brand of poking fun at men, women, and husbands. While it is difficult to know what songs she sang, the Chicago Tribune occasionally ran a column called "Why They Laugh in Vaudeville." 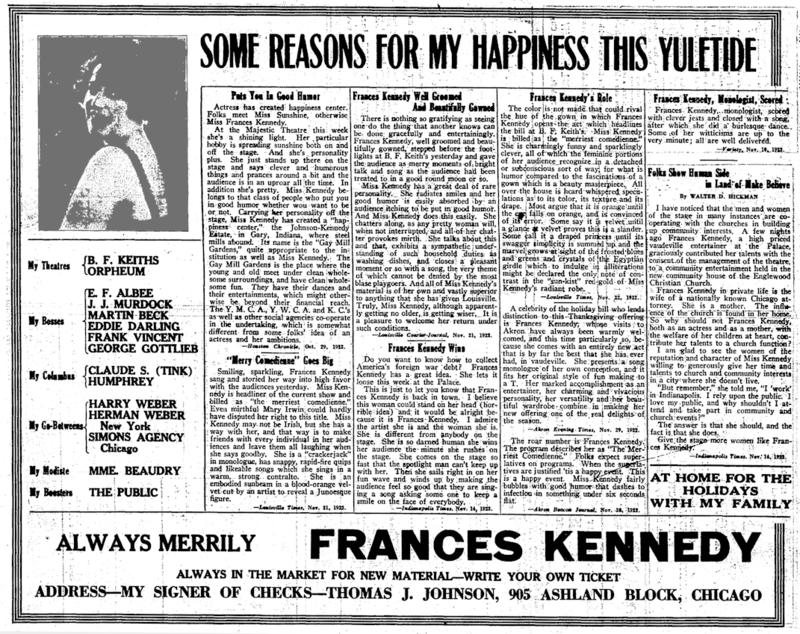 The jokes Frances told are from that column in two issues in 1919. If they don't make you laugh just remember: you probably needed to be there; timing is everything. "Why They Laugh at Vaudeville" - Frances Kennedy. New York Clipper, January 9, 1918. Reviewers never put the song titles of her songs in the reviews. It is assumed that she bought songs from a variety of songwriters besides the ones from William Friedlander that she started out with. Occasionally ads for her shows would have “Songs by so-and-so” below her name, but the only one that I’ve found is “Jean Haves,” who I know nothing about. Curiously, I’ve found two pieces of sheet music on E-Bay, one of which I bought, that feature her picture on the covers. Frances was very familiar with Buffalo, and Buffalo with her. 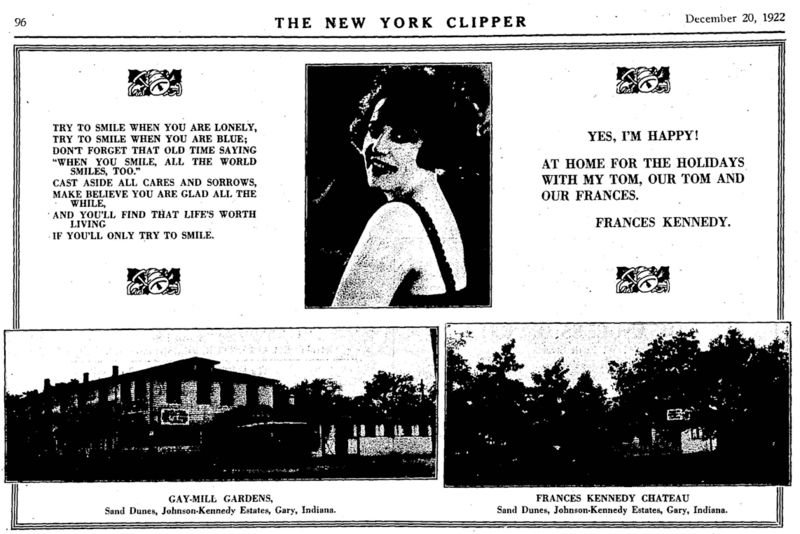 Her agents no doubt placed the ad for her at Mike Shea's in March of 1918 in The New York Clipper. Frances had performed in Buffalo in the musical comedies and as a vaudevillian she would return to Buffalo a number of times in the future. While 1918 through 1921 were busy and jam packed with billings and shows, I’m going to focus on only two seasons beginning in the fall of 1921 to the spring of 1923 to give sample of what vaudeville entailed for the performer. 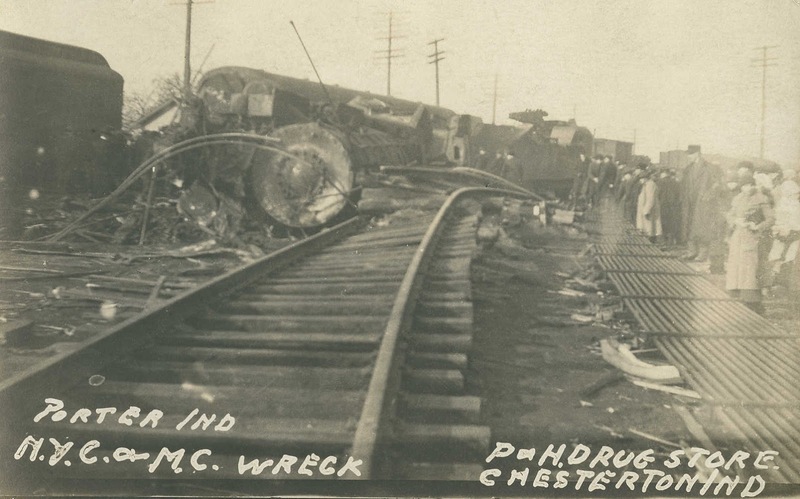 Two incidents stand out that are worth noting, one for her being heckled in late May, 1920, the other for her near death in a train accident in Porter, Indiana in February of 1921. The heckling incident was reported on the front page of the New York Clipper’s June 1920 issue with the title “Rowdies Busy at Royal.” While I’ve not been able to pin down exactly what town or theater this was, or find other newspaper accounts, the incident seems to me to be anti-Irish inspired; I can’t think of any other reason. Then the house went into an uproar. There were cries of “Miss Kennedy, come back and do your act, the audience wants you, don’t mind those rowdies,” and the like. (For a detailed examination of the accident in Porter see Steve Shook's page on the wreck. where there are a lot more images as well. While she performed many places the rest of 1921, we pick up her travels beginning in January, 1922: billings in Minneapolis - La Crosse - Olathe, Kansas - Sioux City - Madison, Wisconsin on the Orpheum circuit. Back in Chicago at the beginning of February she did a fill in at the Majestic and her 11 year old daughter turned theatrical, writing and producing a playlet that was presented at the Chicago Summer School on February 3rd. (Footnote: “Little Frances Kennedy Writes,” Variety, February 17, 1922, page 9. The play was called “Blossom Time in China.” ) On to Rockford the first week of February, St. Louis for the week of the 12th, two shows a day followed on the stage by Houdini. And then back to Rockford - Davenport and Madison until March 11, then to Springfield, Illinois, and Chicago. She’s an “added feature” in Charlotte, North Carolina for a week in the middle of March. 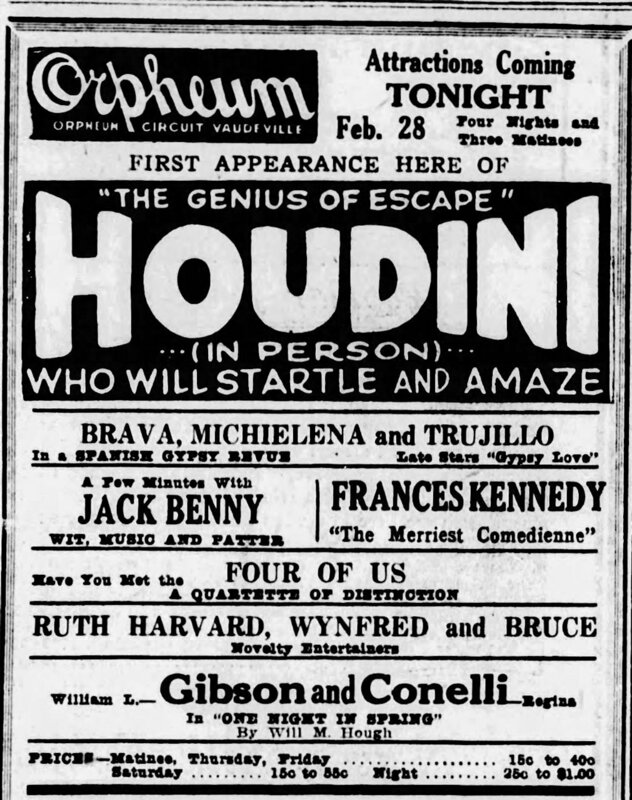 After her trial in Chicago on March 22, more about that below, she was in South Bend for a week starting the 27th, on the same billing as the magician Horace Goldin, whose act was to saw a woman in half. Likely she used a number of different dressmakers in Chicago, one unlucky one was Morris Kutock, an Evanston tailor. When he failed to have a $175.00 (about $2,600.00 in 2017 money) dress ready for pickup on February 4, 1922 Frances refused it after her tour of several cities to the west. (Footnote: Variety shows her booked in Sioux City, Iowa the week of January 30th as well as Rockford and Madison in the early part of February. ) 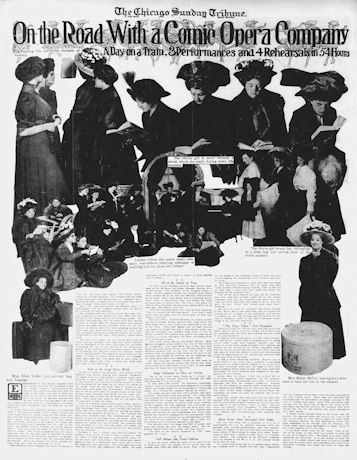 Kutock took her to court and in a decision recounted around the country in many papers, lost his case in front of an all women jury, the first of its kind in Illinois; Frances claimed that in three weeks it had gone out of fashion. Theater historian Angela J. Latham discusses this case in her book Posing a Threat, pointing out that Frances’ win likely may have had a detrimental effect in the progress towards women taking part in the judicial system in Illinois, where they had just won the vote. (Footnote: Latham, Angela J. Posing a Threat: Flappers, Chorus Girls, and Other Brazen Performers of the America's 1920s, 2000. Print. ) While, according to Latham, newspaper accounts portrayed Frances as coy and artful in her testimony, she definitely had the sympathy of the six young women on the jury. Latham claims that the socio-economic status of her husband and defense attorney no doubt helped her, but it should be remembered that Frances herself was well known among theater goers in Chicago, young and old. For a transcription of the United News Service wire on the case the appendix. Gay Mill was getting underway, and the April Variety made note on page one of her being a prize-fight promoter at Gay Mill. This was Tom’s doing though, for she was still very much involved in vaudeville, performing at the Kedsie in Chicago and then Racine for three days. She also got involved a musical comedy, “And Very Nice, Too,” that opened in Montreal, Canada May 8th at the His Majesty’s Theater. 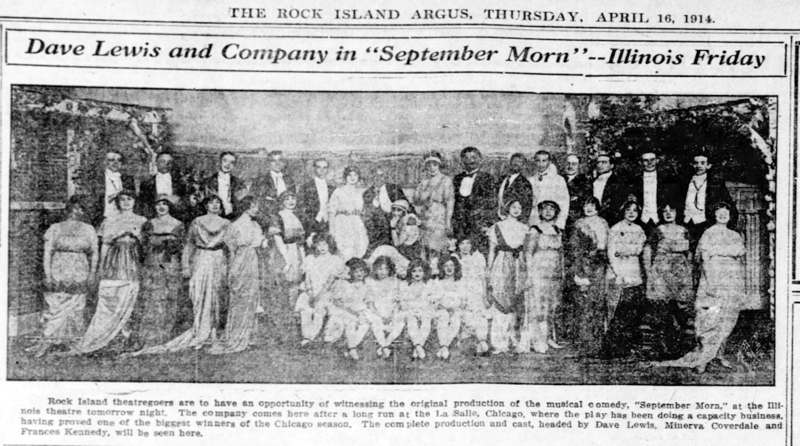 (Footnote: “New Musical Play Has Its Premiere,” The Gazette, Montreal, Canada, May 9, 1922, page 9. ) According to the Montreal papers, the play had rehearsals in New York and theater managers were in Montreal to preview the play for possible openings in New York, but evidently the show fell by the wayside when one of the actors was jailed for bigamy, convicted and sentenced to two years in the Kingston Penitentiary. (Footnote: The Gazette, May 8, 1922, page 6; June 3, 1922, page 1. ) The play ran for two weeks and died there in Canada. After the San Francisco shows, Frances changed billings to the Oakland Orpheum theater where the Oakland Tribune gave her a headline review titled “Frances Kennedy Wins Orpheum Headline Place – Dainty Comedienne Romps Off With Laugh Honors in Well Balanced Bill.” After two shows in San Bernardino, ads reading “You’ve Seen Eva Tanguay – You’ve Seen Trixie Friganza – Now see Frances Kennedy, Variety’s Brightest Star”, she went on to Los Angeles to hook up with Houdini again in shows at the Hillstreet Theater for a week. (Footnote: Oakland Tribune, April 3, 1923, page 31; Advertisement, San Bernardino County Sun, April 15, 1923 page 16; Advertisement, Los Angeles Times, April 23, 1923, page 21. ) 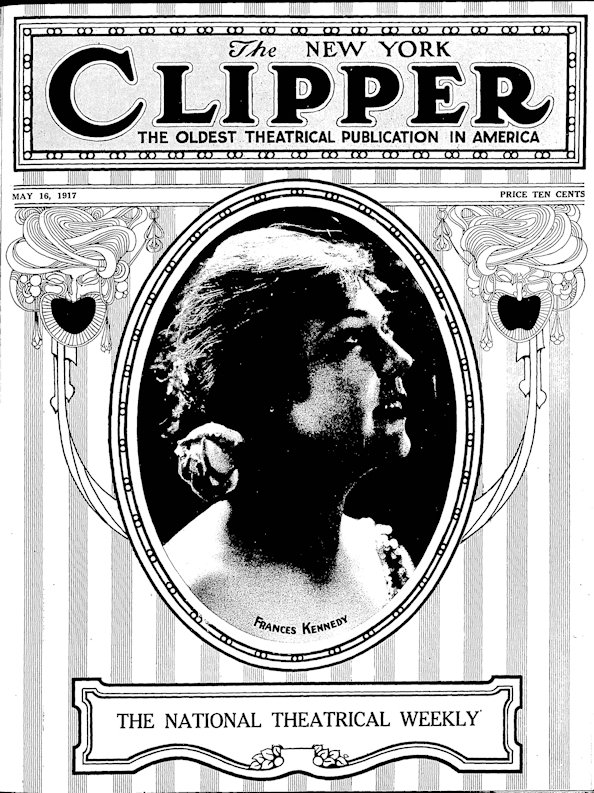 The tour ended there and Frances took the long train ride back to Chicago and Miller Beach for the summer, but not before she sent a telegram to the New York Clipper from Los Angeles to tell them she was finishing up her Orpheum tour and to wish The Clipper a happy seventieth anniversary. (Footnote: New York Clipper, May 9, 1923, page 33. ) Perhaps if she’d have stayed in Los Angeles she would have become famous like her co-worker that spring, Jack Benny. 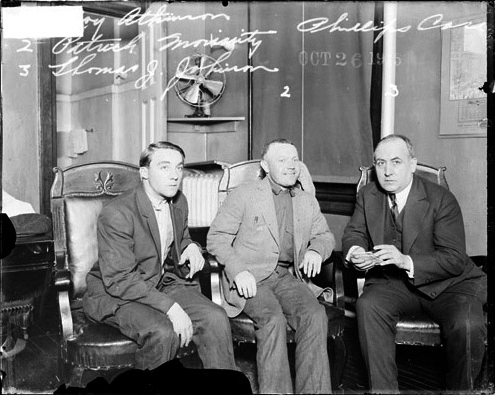 Tom (on the right) with Patrick Moriarity and Roy Atkinson, who were charged in the murder of Harry Phillips, a West Madison street jeweler in October of 1915. Thomas J. Johnson had been wooing Frances for some time before she finally realized that she was in love with him and agreed to marrying him at the end of the run of The Isle of Bong Bong. 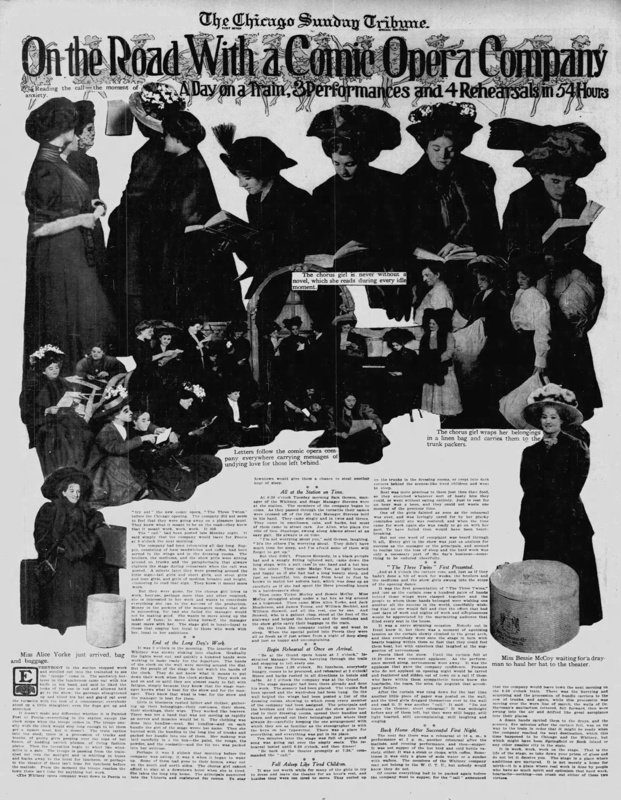 Newspaper stage reporters are always looking for “behind the scenes” stories, and one dug this out in a 1908 column called “Good Wives in Chorus.” (Footnote: “Good Wives in Chorus,” Chicago Tribune, May 10, 1908, page 73. ) Most of what is known about Tom, as she referred to him in the papers, was written by Archibald McKinlay in 1989 in the Hammond Times. (Footnote: McKinlay, Archibald, “Calumet Region winds down to radio station.” Hammond Times, April 9, 1989, page 76 Main Edition. ) Tom was the prosecuting attorney for the City of Chicago sleuthing out and prosecuting arsonists when they married. (Footnote: In one such case he prosecuted a 17 year old arsonist for setting at least 16 fires. “Confess to More Fires,” Chicago Tribune, October 2, 1904. ) McKinlay wrote that in the wake of the deadly Iroquois theater fire of December 30, 1903 that it was Fire Inspector Johnson who cracked down on theaters around the city enforcing and creating codes for theaters. Leaving public service Tom became a very successful criminal defense attorney, getting acquittals in 84 murder cases according to McKinlay. In 1923 he was named chief arbiter of the Showmen’s League which had been formed in Chicago in 1913 with Buffalo Bill Cody as its first president. “With powers similar to those enjoyed by former Judge Landis in baseball,” his task was to “clean up” all outdoor amusements, carnivals, circuses and fairs throughout the United States. (Footnote: “Outdoor Showmen Pick Commissioner to Purify Business,” Chicago Tribune, March 19, 1923, page 21. ) While this was likely needed, not everyone appreciated the high-handedness, one columnist calling Tom the “High Exalted Ruler, Supreme Kleagle, and Omnipotent Overlord…Grand Boss of the circus, sideshow, carnival, and amusement world. The Judge Landis of the circus is given unlimited powers and may impose a $10,000 fine and three-month suspension on any African lion that talks back to him.”(Footnote: Phillips, H. I., “Overlording the Outdoor Show World,” Philadelphia Inquirer, March, 26, 1923, page 15. This an amusing rant. ) The impetus to “clean up” the fairs and circuses came from the publication of “Confessions of a Fair Faker” in Country Gentleman Magazine in June of 1922. (Footnote: The Country Gentleman, (Philadelphia, PA), Volume 87, April 8, 1922, page 4 ff. Online at The HathiTrust. ) Despite the grumpy, but funny Philadelphia editorial, many papers around the country applauded the new efforts. (Footnote: An example is “It’s Now or Never For Carnivals,” Deadwood Telegram, Deadwood, SD, June 23, 1923, pp. 2-3. A rather long interview with Tom and his association with the Showmen’s League and his newly appointed position as Commissioner. ) Tom’s official title was general counsel and commissioner of the Showmen’s Legislative Committee of America. He continued to defend clients in Chicago as well. When Is a Dress Out of Style? Alexander F. Jones, United News Staff Correspondent, Chicago, March 22. Jurors may have their troubles when it comes to the consideration of ethics of murder, but in taking up the more vital question of how long present fashions last, they are sure-fire, unanimous and instantaneous. The first panel of women ever called to a jury box in Illinois proved this in Judge Witkower’s court in Evanston in one minute Tuesday by deciding that a gown created Feb. 5 may be utterly obsolete March 16. Morris Kutock, foremost designer of women’s gowns on Chicago’s glittering north shore, appeared before the jury with one of his masterly creations on his arm. Honest tears stood in his eyes as he described the grace of its lines, the inspiration of its creation, the incomparable softness of its fabric and the sheer genius in its blended colors. His attorney backed him up and insisted that Frances Kennedy, the actress, pay $175 for it. Miss Kennedy had ordered it and simply refused to take it, he said. The jury of her sisters looked inquiringly at Miss Kennedy. Her chances of winning the suit looked black indeed. She took the stand and in ten minutes Mr. Kutock went from there, sadly, the gown still under his arm. “It was like this,” testified Miss Kennedy. “I ordered the gown in January and it was to be ready positively by Feb. 4. Feb. 5 I had to go out on tour without the gown because it wasn’t ready. Miss Veronica Gannon, one of the jurors, leaned forward. “My dear, what were you going to wear with it?” she asked. “Black silk stockings and satin pumps to match,” replied Miss Kennedy. Judge Witkower rapped loudly for less conversation between the jury box and the witness stand. “I had to leave before I had a fitting,” replied Miss Kennedy. “Without a fitting?” chorused the jury. “If the ladies please,” the court commenced. “Your honor, we find for the defendant,” said Miss Gannon, forewoman. “Very well,” said Judge Witkower. And try as attachés might throughout the rest of the day, they could not find him. Story printed in the Des Moines Tribune March 22. Some form of it was printed in papers around the country. Photo above in the Chicago Tribune March 19th. Jury photo: see photo credits below. This page grew out of researching the history of Gay Mill Gardens in Miller Beach, Gary, Indiana. I got interested in the people who had built Gay Mill, who were only named as vaudevillian Frances Kennedy and Attorney Thomas Johnson in existing histories. They had, however, brought the first radio station to Northwest Indiana not to mention a number of years of dancing and entertainment to the people of Gary, Miller Beach and the surrounding countryside. 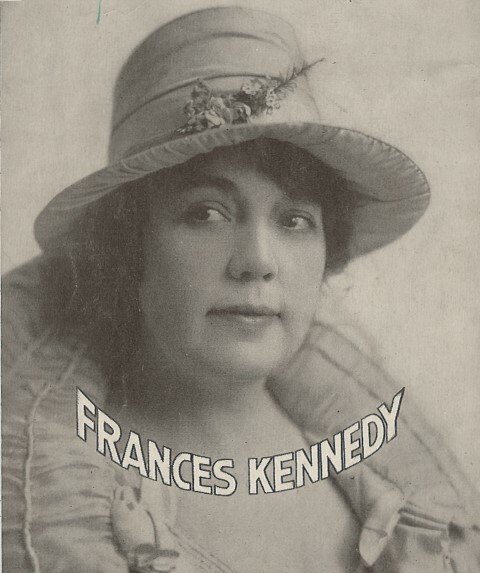 In just an initial search on “Frances Kennedy” in Newspapers.com I got tons of hits for the years between 1904 to 1936 from all over the country. Intrigued, I began narrowing it down and slowly compiled a history of her career. I have a lot of things not included in this page, and there is likely more to be found. The study became more about theater, about which I know little, as it did about local history. To that end it provides a glimpse of what the life of a dedicated performer who was also a wife and mother might have looked like in the first decades of the twentieth century. Frances never made a recording that I know of. She never went into films, which is likely one of the reasons she was never recognized by students of the era. She wasn’t flamboyant or outrageous like Eva Tanguay or some of the other vaudevillians, but she shared billings with, or “rubbed elbows,” with such as Sophie Tucker,(Footnote: Sophie Tucker worked a number of vaudevillian houses in and around Chicago in the first three decades of the twentieth century per the newspaper ads that appear. ) Jack Benny, and many of the stars of vaudeville in New York and the east; she shared a stage with Sarah Bernhardt at Chicago’s Majestic in 1918. What I’ve learned about her career is mostly from the newspapers as well as the pages of The New York Clipper and Variety. 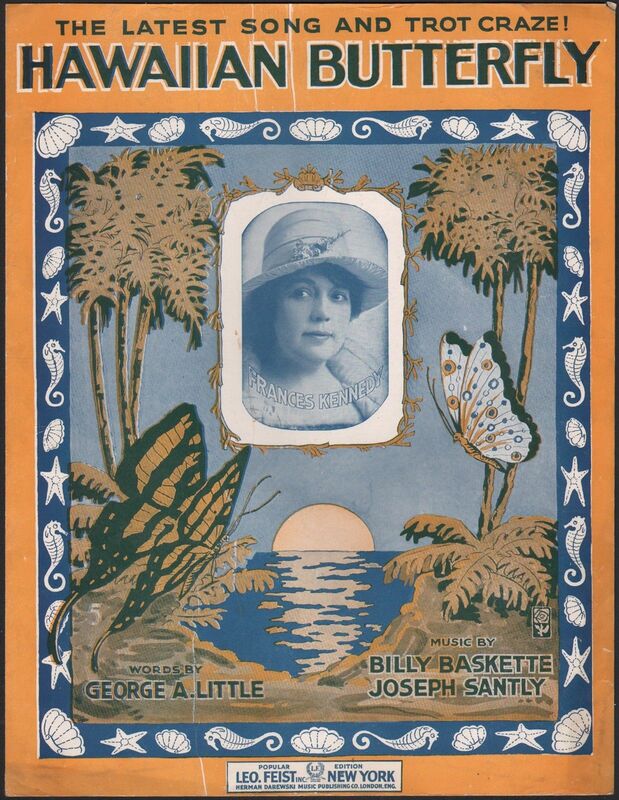 There are a few pictures in the online digital collections of the Chicago Public Library and the Chicago History Museum but likely more in their archives, including playbills and programs. Feel free to contact me if you have any questions. A few resources used in this page. Newspapers.com was the primary source. Searching there is an acquired art but can be very rewarding. Variety is online at Archive.org but going there directly presents some cataloging problems. I found it best to go to The Media History Digital Library Hollywood Studio System Collection and scroll to Variety which will open a listing of the volumes by month. If you "Read" it will take you to archive.org's digitization which is then browsable or searchable. The University of Chicago has a huge collection of Playbills and Programs. The Chicago History Museum also has a huge collection of photos, playbills and programs. Listings of them by theater are A to H. and I to Z. Mentioned in the footnotes is Douglas Gilbert’s 1940 book American Vaudeville is full of stories and insights into the early history of vaudeville. John Kendrick's Cyber Encyclopedia of Musical Theatre, Film & Television is jam packed with information. The Anna Held and cast photo is a composite made from image at the Jewish Women's Archive Encylcopedia crediting the Library of Congress and the cast photo from the Seattle History website. https://jwa.org/encyclopedia/article/Held-Anna and http://www.seattletheaterhistory.org/photograph-record/scene-mamselle-napoleon respectively. Accessed January, 2019. Sheet music covers are from eBay sales pages. "Let's All Be Good Pals Together" I purchased and the picture at the top of the page is a crop from that cover. Photo of Tom with Moriarity and Atkinson are from the Chicago History Museum searching "Archie". Original is from the Chicago Daily News photo archive online at the CHM. Photo of the dress case jury is also from the Chicago History Museum. DN-0074193, Chicago Daily News negatives collection. 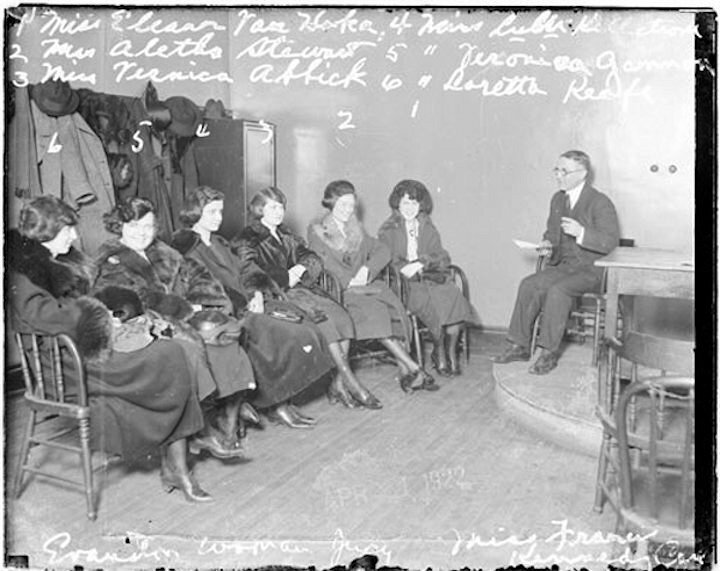 Informal portrait of (left to right) Miss Eleanor Van Hoka, Miss A. Stewart, Miss Veronica Abbick, Miss Lulu K., Miss Veronica Gemmon, and Miss Loretta Keafe sitting in a row with an unidentified man in front of them in a room in Chicago, Illinois. "Evanston woman's Jury Miss Frances Kennedy." Click Here to show or hide the complete list of footnotes.